There's lots to like about the Spectre 13 -- especially given the low price. For the money, you can expect an attractive design, bright display, fast performance and a generous warranty. But you should also prepare yourself for middling battery life and one frustrating trackpad. How would you rate the Spectre 13? When the Spectre 13 Ultrabook first launched late last year, a company rep told me that the laptop takes design cues from other luxury items -- namely, expensive cars. As much as that sounds like marketing hooey, it turned out to be a pretty smart strategy on HP's part: The brown lid, metal keyboard and champagne-colored chassis make the machine look... expensive. To be fair, the build quality helps too -- the palm rest doesn't flex or bend when you hold it in one hand and, thanks to a strong hinge, the screen doesn't wobble when you touch it. I also appreciate how clean the bottom side looks, right down to the metallic accents surrounding the rubber feet. (Of course, a clean underside means the parts aren't user-replaceable, but that's par for the course for Ultrabooks.) Really, my only complaint is that the brushed-metal lid picks up scratches too easily, but then again, the same thing can be said of the MacBook Air. 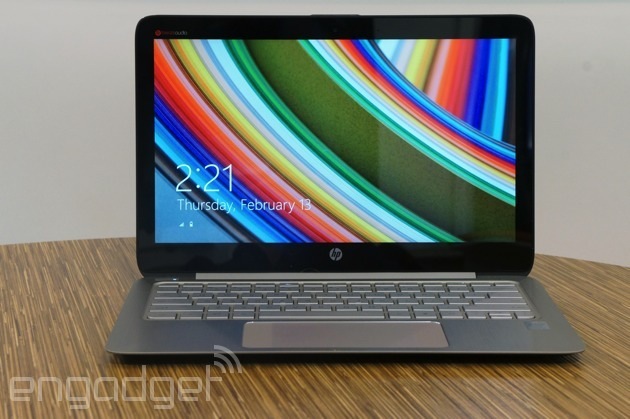 Actually, I do have a second complaint: At 3.34 pounds, the Spectre 13 is actually on the heavy side for an Ultrabook. Case in point: The Lenovo Yoga 2 Pro and Samsung ATIV Book 9 Plus both come in at 3.06 pounds, while some models, like the Acer Aspire S7 and Sony VAIO Pro 13, come in well under the three-pound mark. All that said, it won't break your back to put it in a bag -- I even got away with using a leather tote. 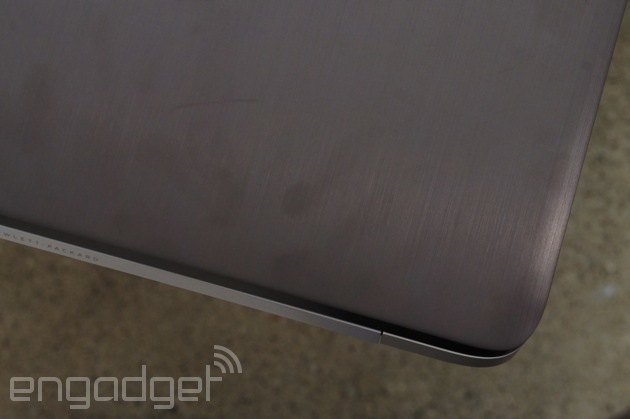 Also, for what it's worth, the cut of the laptop at least makes it comfortable to hold; the wide, blunt edges leave lots of room for your fingers, and the chamfered hinge is also easy to grip. 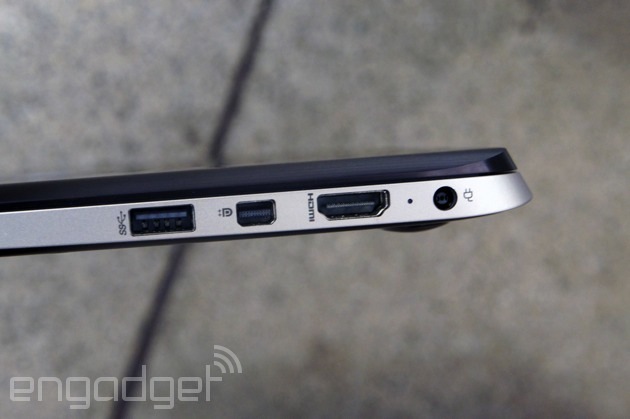 Speaking of those wide edges, the Spectre 13, as hefty as it is, does make room for a good selection of ports. These include two USB 3.0 connections, a full-sized HDMI socket, Mini DisplayPort and an SD card reader, along with the requisite headphone jack and power connector. Though the Spectre 13 is available with a 2,560 x 1,440 display, we tested it out with the standard 1,920 x 1,080 option. Even with the lower (but not "low") resolution, it's still a lovely screen. The viewing angles are wide enough that I was able to watch many a Netflix movie from all sorts of angles -- head-on, from off to the side, lying on the couch, dim light, fluorescent light. The Spectre 13's display thrives in most any environment, and the colors are nice and punchy too (but don't worry, not too punchy). The kindest thing I can say about the Spectre 13's keyboard is that I ultimately got used to it. Well, mostly anyway. Even now, after weeks of use, I still frequently have to go back and correct a typo, because my key presses didn't register the first time around. It's a shame because the buttons are well-spaced and easy to find without taking my eyes off the screen. And yet, between the shallow pitch and lack of bounce, it's quite possible you'll find someting something you wrote has a letter or two missing. If you're like me, you'll adjust your typing style over time without even really thinking about it, but even then, you'll make some annoying mistakes. For most people, the layout here will be fine, especially since Ultrabooks by definition tend to have flat, space-saving keyboards. But if typing is of the utmost importance, you can still do better (might I suggest the new ThinkPad X1 Carbon?). Unfortunately, I can't be nearly as charitable about the touchpad. 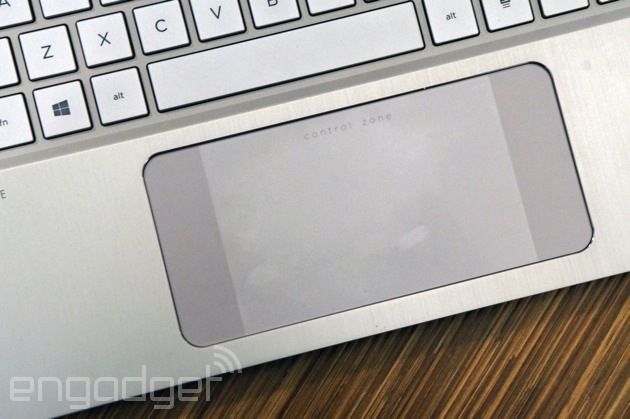 Which is ironic in a way, because the trackpad, with its so-called touch zones, was actually designed to reduce erroneous clicks. Here's my problem: The main surface has way too much resistance, so that if I want to do something like scroll or pinch to zoom, I have to go out of my way to apply pressure with my fingers. I'd rather I didn't have to think about it at all. What's worse is that even when I do think about it, the touchpad doesn't always respond the way I want it to; oftentimes, I either used the touchscreen to scroll through web pages, or (carefully) dragged my cursor to the arrows along the side of the screen. Not an ideal situation. And what of those clearly marked touch zones? They do a good job of separating the "Windows 8 gesture" areas from the "regular touchpad areas," so that you know exactly where to swipe if you want to expose the Charms bar or cycle through open apps. The thing is, most other touchpads do this just fine, even without an obvious line separating the main touch surface from the edges. Rather than solve a problem that doesn't exist, we'd rather HP issue a driver update to ensure the touchpad works properly. After using the Spectre 13 for weeks, I can assure you that the Spectre 13's performance never calls attention to itself. And that's a good thing. Throughout, as I was writing stories, streaming Netflix and Pandora, juggling browser tabs and talking in HipChat, I had no problem opening apps and switching from one program to another. The fast 10-second startup time is also easy to get used to, perhaps because almost every Ultrabook these days can cold-boot in a similar time. If anything, the biggest thing holding me back from getting work done was that flaky trackpad, but I, of course, won't lay that at Intel's feet. As it turns out, too, that brisk performance wasn't just a figment of my imagination: The Spectre 13 bests most of its Ultrabook peers, even those that have the same dual-core Core i5-4200U processor. In particular, you've gotta hand it to the Liteon solid-state drive, which achieves not just category-standard read speeds of 527 MB/s, but also write speeds as high as 327 MB/s. Big improvement over the SSDs in most of the other Ultrabooks we've tested. To say the Spectre 13 has "middling" battery life would be like saying a fourth-place Olympic skier is "slow." The truth is, with eight and half hours of continuous video playback, according to our tests, it does rank somewhere in the middle as far as new Ultrabooks go. Sure, it's no MacBook Air, which lasts nearly 13 hours on a charge. Then again, we've tested a handful of other models capable of eight to 8.5 hours, so at the very least, the Spectre 13 finds itself in good company. Besides, doesn't eight and a half hours count as "all-day battery life" for lots of people? We think it does, especially if you expect to be near an outlet for at least part of that time. And if eight hours isn't enough, the sad truth is that most Haswell-based Ultrabooks won't last longer than that anyway. And most "regular" notebooks won't last longer than an Ultrabook, at least not without the help of a secondary battery. So even if you do need more runtime, this is very nearly the best you can do. Though HP didn't pre-load the Spectre 13 with much extra software, what's there calls a little too much attention to itself. I'm mainly referring to McAfee LiveSafe, which constantly greets you with pop-ups when you boot up and go to the desktop for the first time. The good news? HP at least threw in a year of McAfee service, as opposed to just 30 days, so you can at least get some use out of the app for a good while after you purchase the laptop. In addition, HP also included Adobe Lightroom 5 (nice! ), Box, HP Connected Music and HP Support Assistant. The Spectre 13 starts at $1,000 with a dual-core Core i5-4200U processor, 4GB of RAM, a 128GB SSD, 1,920 x 1,080 display and 802.11n WiFi. Basically, then, for a thousand bucks you're getting specs that a year ago would cost you as much as $1,400. What's more, even the base model includes a two-year warranty -- about twice the coverage you'd get on most any other consumer PC. Of course, no one's stopping you from spending $1,400 if you do indeed want cutting-edge components. This year, that means a dual-core Core i7-4500U processor, 8GB of RAM, 256GB of storage, a 2,560 x 1,440 screen and a faster 802.11ac wireless radio. With all the trimmings, you're looking at a price of $1,435, not including extras like Microsoft Office. We've already name-checked most of the Spectre 13's main rivals, but it's worth circling back to talk about what makes each of them a potentially good (or not-so-good) buy. Perhaps its most direct competitors are the Lenovo Yoga 2 Pro ($899-plus) and Samsung ATIV Book 9 Plus ($1,400 and up), both of which weigh about a quarter of a pound less and come standard with 3,200 x 1,800 screens -- likely the same one, actually. If anything, the Yoga 2 Pro will win you over with its convertible design, which lets you use it as a notebook, tablet and in "Stand" or "Tent" mode, with the keyboard tucked out of the way. Our big caveat there is that the battery only lasts 6.5 hours, making it one of the shortest-running Ultrabooks we've tested lately. The ATIV Book 9 Plus, meanwhile, delivers almost identical battery life to the Spectre 13, but again, weighs a lot less. Point, Samsung. Meanwhile, you might also want to check out the 2.34-pound Sony VAIO Pro 13 ($1,250-plus), the lightest laptop in its class. Despite its pin-thin frame, it manages to match the Spectre 13 in battery life. Similarly, the 2.87-pound Acer Aspire S7 ($1,350-plus) ekes out some respectable runtime, even if it's not quite as long as the Spectre 13's. Word to the wise, though: We're betting that if you get the Acer Aspire S7 with a 2,560 x 1,440 display instead of the 1080p panel we tested, the battery life will probably dip. Finally, we have two oldies. One is the Dell XPS 12 ($1,000-plus), which came out in 2012, but has since been refreshed with Haswell processors, NFC and a bigger battery. In short, we like it a lot. 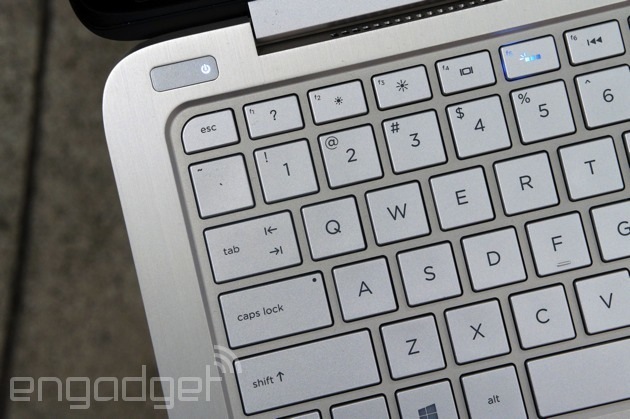 Finally, there's the Toshiba Kirabook. Though it was one of the first Ultrabooks to rock a 2,560 x 1,440 display, we ultimately panned it because it launched at $1,600 with already-old processors. Now that it's been refreshed with Haswell processors, you can surely expect longer battery life. But man, that $1,500 starting price still stings. It's easy for us to give the Spectre 13 a good review, but that's partly because the price is so reasonable. Were this priced in line with its peers, we'd have a harder time forgiving its flaky trackpad, sticky keyboard and relatively heavy weight. As it stands, though, it offers an attractive design, fast performance, a bright display and a generous two-year warranty, all for a relatively low $1,000. For the money, you can get used to the keyboard, and the slightly heavy design won't kill you, either (though we still think there should be a bigger battery inside). 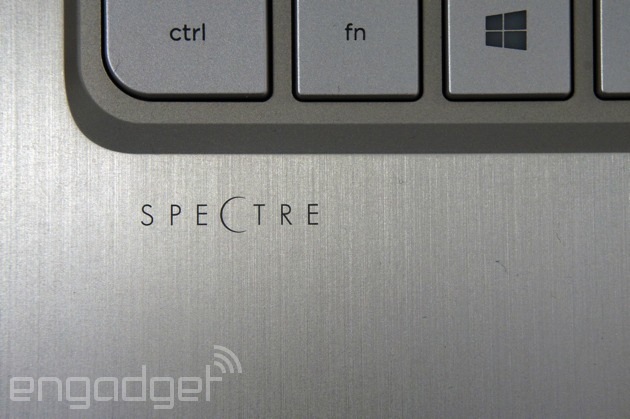 Assuming HP can come through with a much-needed touchpad update, the Spectre 13 is a solid, if imperfect, choice.